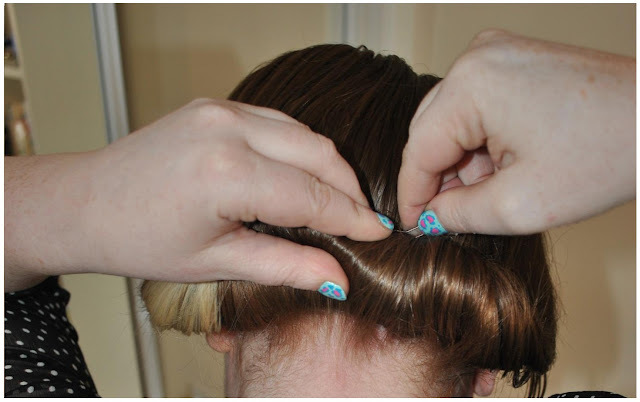 I was looking through my blog stats the other day (as you do) and was quite surprised to see that my previous hair tutorials (how to use a hair doughnut & how to do a twisted hair updo) had over 4,100 views between them! 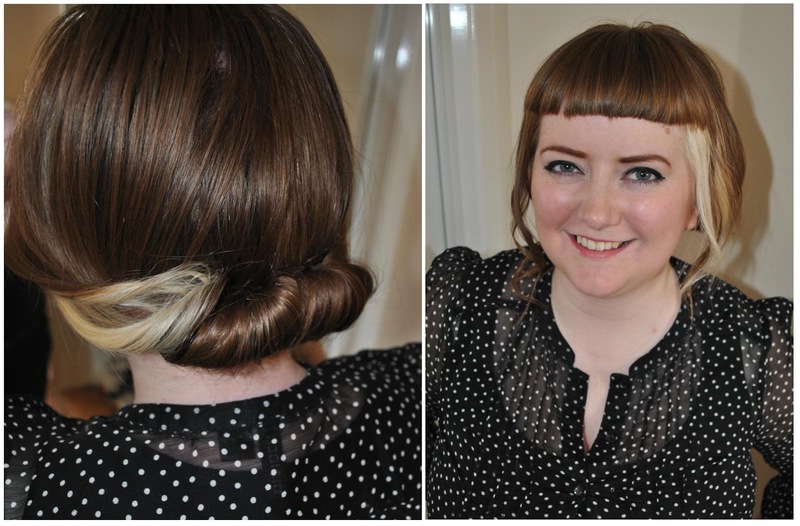 So I thought it definitely was time to do another one, and wanted to show you all a very easy updo. I did it earlier (with the lovely Craig helping out and taking photos), but when I started to put this post together I realised it was quite hard to see what I was actually doing in the photos. So I am being BRAVE and have made a wee youtube tutorial which hopefully explains it simply. Please be kind! I've also included the photos and a brief how-to below in case you aren't a fan of videos. I wasn't quite sure what to call this hairstyle.. is it a twist? Is a a roll? 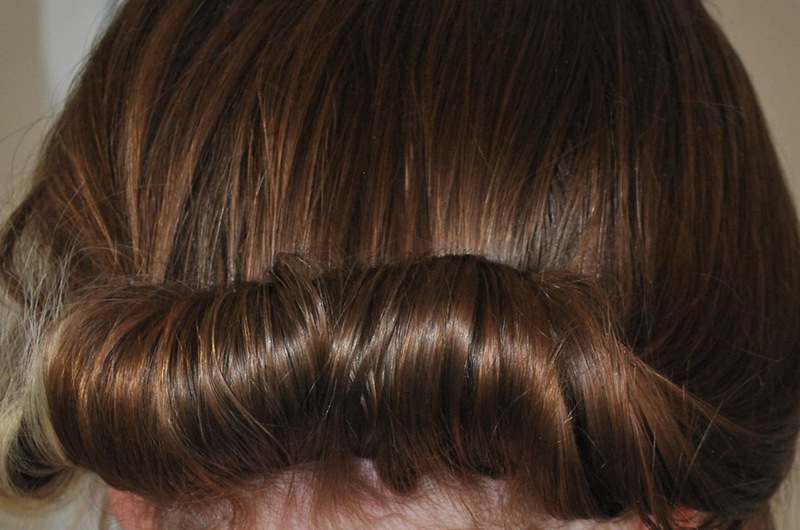 It makes me think of vintage hairstyles, which I like, and you can make it as sleek or scruffy as you'd like. Plus you don't need anything other than a hair bobble and kirby grips! 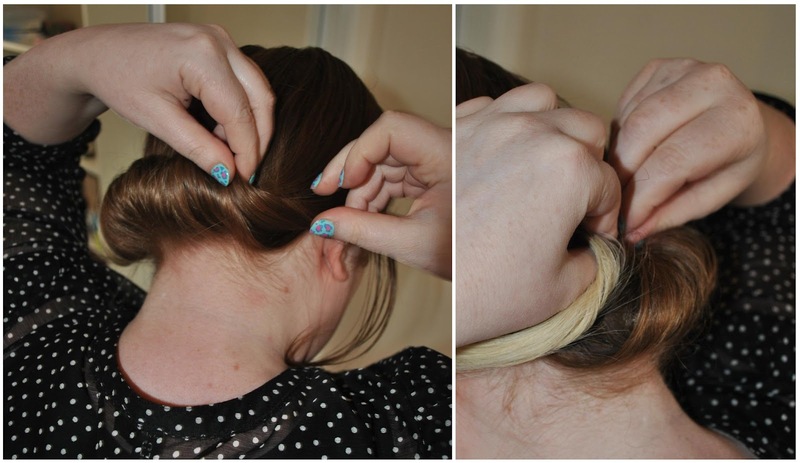 You want to start by putting your hair in a low ponytail, at the base of your neck. 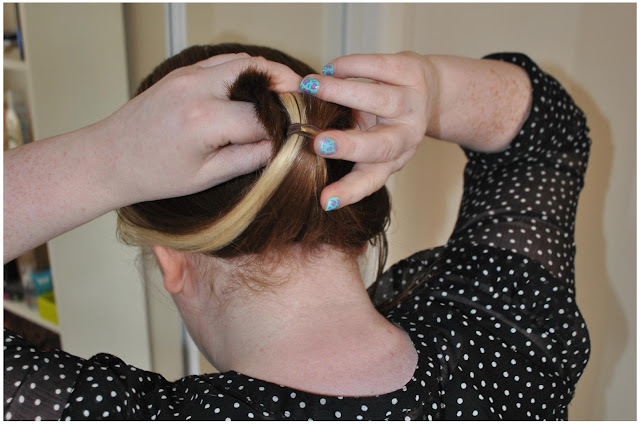 Then pull out the hairband until it is about half way down the ponytail. 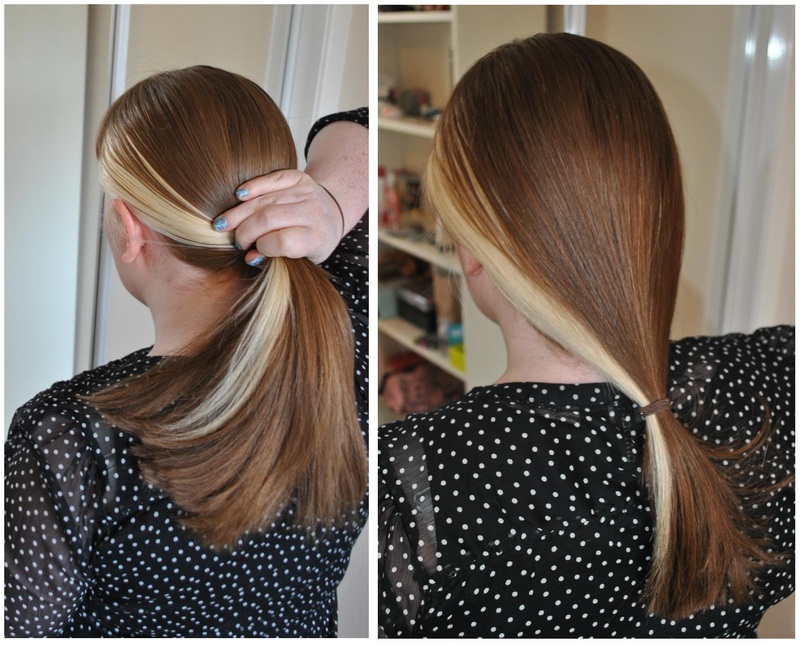 Now take the end of your ponytail and start wrapping it around itself, making a roll. You want to roll this down into the space at the bottom of your hair (I hope this makes sense!). You'll find it makes a nice roll at the bottom of your hair. Try and make sure it's even, and use some kirby grips to start pinning the middle part of the roll. Now add in a couple more kirby grips at each side of the hair roll - this helps keep the sides neat and in shape. 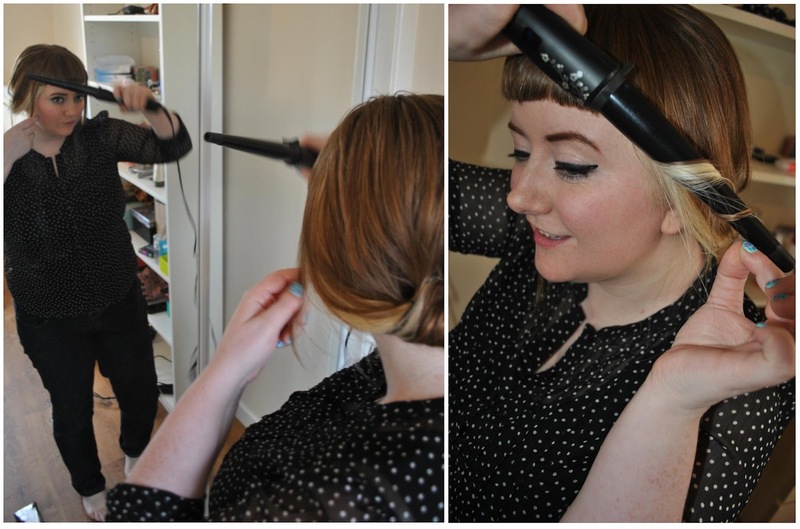 Use curling tongs to loosely curl any hair that is hanging down at the front - this helps keep the shape nice and soft. Tada! There you go! It's so simple to do and I really like it as a quick way to get hair up and out of my face. p.s. please let me know what you think of my video. If it's not too daft I might try doing more video tutorials.. it's much easier explaining things when you can waffle a wee bit! If you are looking for wholesale high-end catier pendents like Louis Vuitton, Prada, Gucci, Versace, Burberry, Fendi, and Christian Dior, The Wholesale waterproof jackets is a good wholesale suppliers' directory. There are many discount gucci handbags more varieties and types of handbags which are popular and designed by famous cheap chanel handbags. wholesale designer handbags can be bought at reasonably cheaper costs from our hermes handbags online store.